Our final day of the walk dawned with a mixture of excitement and sadness. 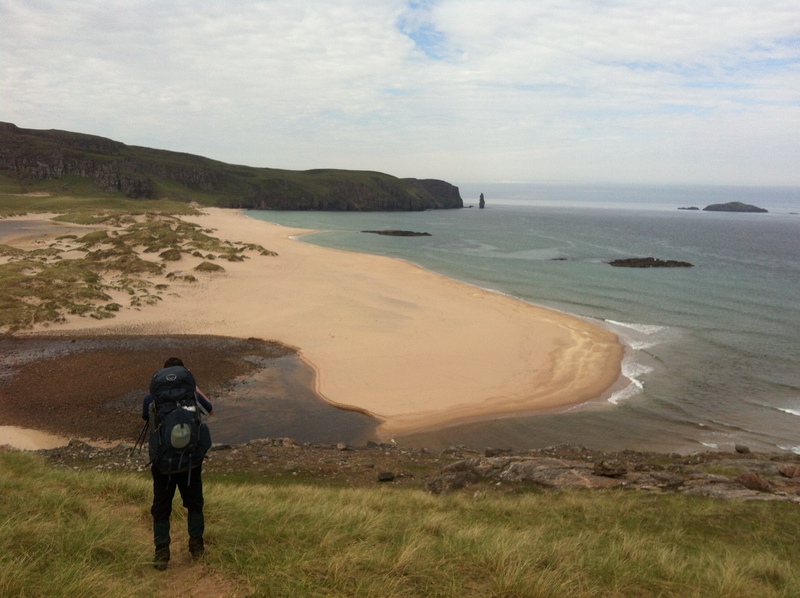 Sandwood Bay was twinkling in the morning sunshine as we packed our tent and headed up over the sand dunes, looking round every now and again to etch the view in our memories until next time. 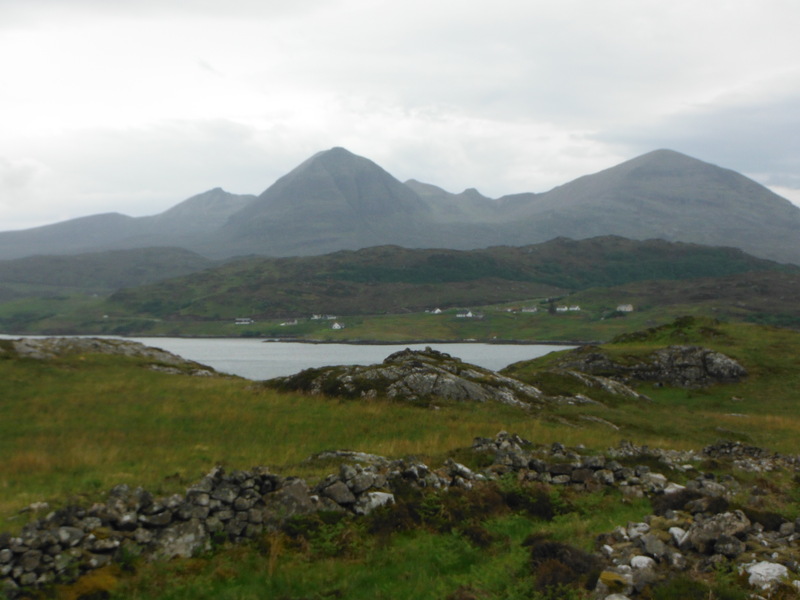 We set off from Rhiconich towards Kinlochbervie along the road. Although the road walking itself was hard on the feet, we were treated to a gorgeous day and lovely views out over Loch Linchard and the coast. At Kinlochbervie we stopped for a quick bite to eat and headed back along the road towards Sandwood Bay for another few miles. Along here we met a woman who informed us alarmingly that there were ‘no toilets at Sandwood Bay, not even a bin to put your rubbish in!’ I guess that mindset comes from stunning Sandwood Bay attracting people from far and wide, but it’s a shame they arrive with these kinds of expectations of remote and wild land. The day dawned in Glendhu bothy to a dull morning with a high wind. This was a shame as we were really looking forward to the views today. We set off right, along the LR track towards Kylesku to the hydro works, turning right just past them to climb for about 3km. We then descended the Bealach nam Fiann to Achfary Forest down to the A838 road and followed this to Lochstack Lodge. Here, we turned left to follow a track past the lodge for about 4km, crossed the Allt an Riabhach and headed across rough, boggy ground for about 1km to the head of Loch a’Garbh-bhaid Mor and continued on the right hand side of the loch for another few kms. This was very strength-sapping, and as the cloud was so low we did not see much. 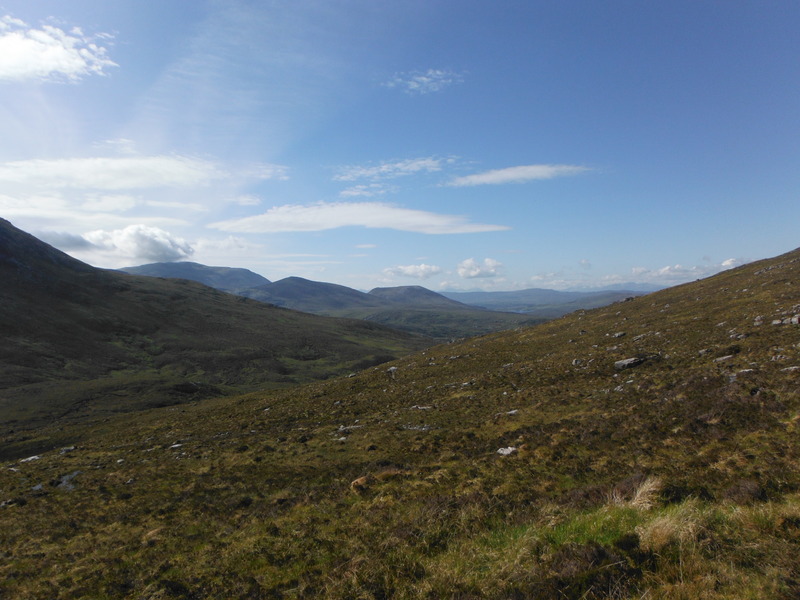 We woke to blue skies, had a good breakfast in the Inchnadamph Hotel, packed our gear and headed off, turning right up the track past the hostel and then left to climb up another, smaller track marked by a cairn. This climbed steadily up over the bealach, past Beinn Uidhe. The relentless heavy rain still battering the bothy in the morning made us faff about and procrastinate. We chatted to the mountain bike guys for a bit, then headed out. At least it was an easygoing LR track to Oykel Bridge. There were lots of estate vehicles passing us all the way there. We made our way along the banks of the lovely River Oykel, one of the best salmon fishing rivers in Scotland. And it showed, as we passed lots of fishing huts and men out fishing. We walked past Loch Ailsh and Benmore Lodge on the LR track and then began the climb up Glen Oykel, following a clear path to some pretty waterfalls. Here the path faded out and we climbed over rough ground to the Bealach Trallgil. At the top we then descended the last 5k into Inchnadamph where we had booked a room at the basic but very friendly hotel. Ahh, we had a great breakfast at the B&B and it took a fair while to get going again. After tanking our whisky supplies in Shenevall bothy the other night, it was imperative that we re-stocked since we would be passing no shops in the next few days. What a pair of desperate dans we must have looked, going into Tesco first thing in the morning with full packs on, to buy a bottle of the finest Benromach! We decanted it to our hipflasks and poured the rest into a water bottle to save weight, and finally left at 10am, the main job completed!